The sound is as it is shown in computer graphics by JINMO on cover art. 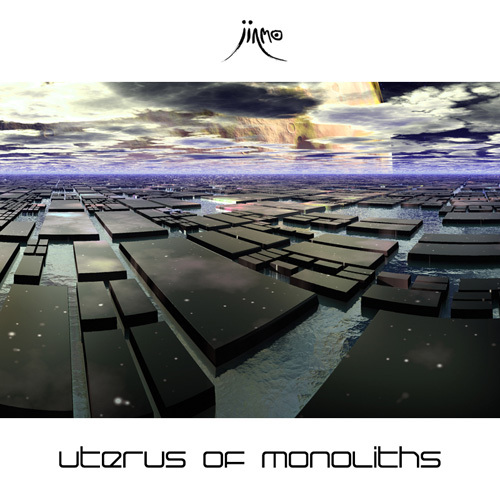 "Uterus Of Monoliths", It is the womb of Monoliths. It filled with amniotic fluid contains Jubilus Meditator, Jubilus Activator, Jubilus Pulsar, Hetero-Glossolalia ... and something new unknown material can not be analyzed. In the womb, "Uterus Of Monoliths", you will see a numberless of monoliths floating in the amniotic fluid, you will feel the quickening of monoliths, and you will hear the incessantly Jubilant cries of the monoliths at ultrasound bandwidth. "Monoliths" are fictional advanced machines in film directed by Kubrick's "2001: A Space Odyssey" based in novels by Arthur C. Clarke's Space Odyssey series, encouraging humankind to progress evolutionary transformations, from ape to man, from man to Star-Child. Our magnificent hit Jubilus series called "Red, Green and Blue, the trilogy of Light", some deep listeners claimed that the series reminded them monoliths. This album, "Uterus Of Monoliths" would be a compilation album in position of Jubilus series. Anger, sorrow, worries, every emotion to the world is going to be calm, into peaceful memories in the womb, "Uterus Of Monoliths". Even if the track ends, monoliths never stop crying and you will find yourself in the womb, "Uterus Of Monoliths". JINMO says "Don’t listen, Feel the amniotic fluid of Jubilus. Evolve yourself. This is dedicated to all Moon-Watcher." "Moon-Watcher", in the novels by Arthur C. Clarke, the first ape evolved into man affected of Monoliths is called "Moon-Watcher". In the fluid of Jubilus, you will find yourself as "Moon-Watcher". NOTE: Headphones listening required for higher-quality listening experience.